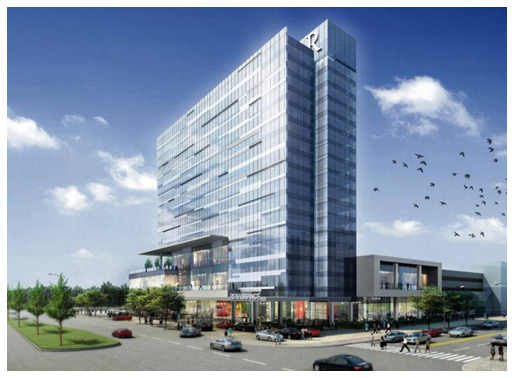 ​​ PLANO - Construction crews have completed structure work on the 15-story Renaissance Hotel at Plano's Legacy West project. The $82 million, 304-room high-rise is under construction at Legacy and Communications Dr., just west of the Dallas North Tollway. With an opening planned in mid 2017, the luxury hotel is one of the most visible construction projects so far in the $3 billion Legacy West development. The hotel is a development of Sam Moon Group. The hotel is part of the $400 million Legacy West Urban Village. The first apartments are opening August 2016 in the project and retail and restaurant will be finished later this year. It's located new office campuses for Toyota, Liberty Mutual, JPMorgan Chase and FedEx Office.